Learn the powerful shortcuts through these problems! Before reading this post, try these three related practice questions. I will give answers and full explanations at the end of this post.
. In this example, 4 is the exponent; 2 is the base, the number that gets raised to the exponent; 16 is the power, the result of the “raising to an exponent” process; and this process itself is called exponentiation. You can read more about the Laws of Exponents here: https://magoosh.com/gmat/2012/exponent-properties-on-the-gmat/. 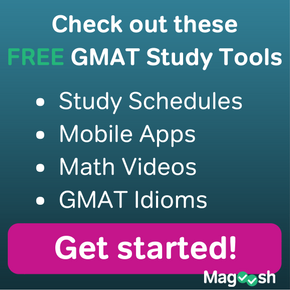 One thing that will help you immensely, especially on GMAT Data Sufficiency, are the patterns of raising different kinds of bases to powers. (a) When you raise a base of 1 to any exponent, the power equals 1. (b) When you raise any base (*) to an exponent of 0, the power equals 1. (c) When you raise a base of zero to any exponent (*), the power equals 0.
in calculus, but on GMAT math, you need not worry about it. We will restate those starred statements as: (b) When you raise any nonzero base to an exponent of 0, the power equals 1; and (c) When you raise a base of zero to any nonzero exponent, the power equals 0. When we throw in a negative sign, things become a little trickier. A base of –1 to any even integer exponent equals 1. A base of –1 to any odd integer exponent equals –1. 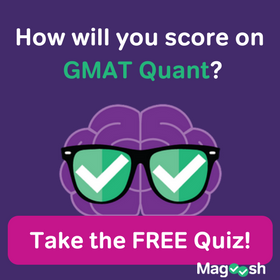 What happens when we raise –1 to non-integer powers is also well beyond GMAT math, so you don’t need to worry about that. The odd/even exponent pattern, though, is very important. In general, a negative base to an even integer exponents results in a positive power. A negative exponent to an odd integer exponents results in a negative power. We will see this played out below, in the four cases. Let look at an example in this category, base = 2. When we raise a base greater than one to positive integer exponents, the powers just get bigger and bigger (that increase is called “exponential growth”). When we raise a base greater than one to negative integer exponents, the powers are positive fractions less than one that get smaller and smaller, closer and closer to zero as the absolute value of the negative exponent increases. Let look at an example in this category, base = 1/2. When we raise a positive base less than one to positive integer exponents, the powers are positive fractions less than one that get smaller and smaller, closer and closer to zero as the exponent increases. When we raise a positive base less than one to negative integer exponents, the powers are just bigger and bigger positive numbers, all greater than one. If the fraction is, like 1/2, the reciprocal of an integer, then negative integer exponents produce positive integer powers, but if the fraction is not the reciprocal of an integer, like 2/3, then negative integer exponents will produce fractions —- 3/2, 9/4, 27/8 — that are all greater than one and increasing in value as the absolute value of the negative exponent increase. In other words, these are negative numbers whose absolute value is greater than one. Let look at an example in this category, base = –2. As the exponent increase through positive integers, the absolute value of the powers increases, but as discussed above, the sign flip-flops: positive for even exponents, negative for odd exponents. Each succeeding power is further from zero, but on the opposite side of the number line from the previous power. As the exponent moves through the negative integers, the absolute value gets smaller, closer and closer to zero, but again, positive for even exponents, negative for odd exponents. Each succeeding power is closer to zero, but on the opposite side of the number line from the previous power. Notice: in this cases, all the negative exponents produce powers that are greater than the original base. In other words, these are negative fractions, with an absolute value smaller than one. Let’s look at an example in this category, base = –1/2. Now, as the positive integer exponents get larger and larger, the absolute value of the power continually gets smaller, closer and closer to zero, but again, positive for even exponents, negative for odd exponents. NOTICE: every positive integer exponent greater than one produces a power that is greater than the base: that much is true in both Case I and Case IV. For negative integer exponents, the absolute values increase, getting further and further from zero, and signs flip-flop, positive for even exponents, negative for odd exponents. Even negative exponents product powers greater than the base, and odd negative exponents produce powers less than the base. Those four cases involve a lot of detail, and if this is your first time exploring these ideas in a while, just remember the power of plugging in numerical examples to figure out each case. It’s a start to know simply that there are different cases: that alone might lead you to see different choices you can plug in to test, say, a DS question. If you struggled with those three DS questions at the beginning, this would be an excellent time to revisit them before peeking at the solutions below. I will solve these in terms of the four cases discussed in this blog. 1) Statement #1: This statement is true in Cases I, III, and IV. That’s not enough to determine whether the base a is positive. This statement is insufficient. Statement #2: This statement is true in Cases I and IV. That’s not enough to determine whether the base a is positive. This statement is insufficient. 2) Statement #1: This statement is true in Cases I, III, and IV. That’s not enough to determine whether the base a is positive. This statement is insufficient. Statement #2: This statement is true in Cases II and III. That’s not enough to determine whether the base a is positive. This statement is insufficient. 3) Statement #1: This statement is true in Cases II only. Numbers is Case II are always positive, so this statement is sufficient to answer the prompt. thanks for your useful work. I was wondering does the GMAT require to know how to solve stuff with x as exponent (exponential equations and inequalities)? Probably not, but do you think could be useful for some creative problem solving? Actually, exponential equations and equalities will sometimes come up on the GMAT. 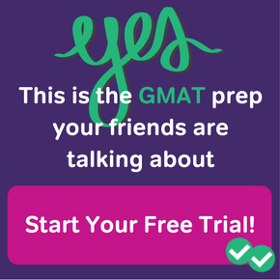 They’re not the most common kind of exponent-related GMAT questions, but you are very likely to see at least one such problem on test day. And yes, knowing how to do equations and solve inequalities within the exponents is a generally useful skill to have, in terms of developing number sense and creativity for math. Q1. Case IV states that higher powers yield smaller results and alternate + and – signs. I don’t see how it is true for statement 2 in this case. Q2 and Q3. For the same reason given above, Shouldn’t case IV also be true for statement 2 of questions 2 and 3. Statement 2 in Q2 and Q3 reads: a^5 0 > a. In Question 3, Statement #1 gives Case I (positive whole #) is NOT true but Case II (Positive frac) IS true. I’m happy to respond. 🙂 My friend, the logic of DS is very tricky, and it takes time to understand all its subtleties. The prompt question is “Is a positive?” This a yes/no about the identity of some unknown value a. It doesn’t necessarily mean that a has to be all positive numbers. It might be that the specific unknown value of a is in Case I or in Case II, we don’t know. We just have to know, whatever the identity of a, whether it is to the right of zero on the number line. Statement #1 would be false in all cases except in Case II. This statement means that whatever value a has, it must be in Case II. Therefore, we know without a shadow of a doubt that a is positive. It does NOT mean that a could be every positive number: that is NOT what the question is asking. Instead, a is a very specific value, and we want to know: is this specific value positive. This statement tells us that it is. Again, this statement is actually a little stronger than sufficient: it not only allows us to give a definitive answer to the prompt question, but it also locates a in a very specific piece of real estate on the number line, the Case II situation. This is actually beyond just sufficient, but for the logic of the DS question, that doesn’t matter. We gave a definitive answer to the prompt, so this statement is sufficient. Now, start from scratch again. We have no idea what the value of a is. Statement #2 allows for multiple cases, either Case II or Case III. According to this statement, a could be positive, but we don’t know. Because we are left in a wishy-washy position with respect to the prompt question, this statement is not sufficient. Remember never to assume that the answer to the prompt question is “yes.” Sometimes it is definitively yes, sometimes it is definitively no, and sometimes we can’t answer it. Never treat the prompt question as an assumption that you are bringing to the statements. Also, when the prompt question is something such as “Is a positive?”, we are NOT asking whether a could be any positive number on the face of the earth. Instead, a is a variable with a very specific value, a specific location somewhere on the number line, and we are simply trying to determine whether it is at a positive location, a location to the right of zero. Dear Mike. wonderful explanation from. I just need to cover a point I always miss. is a positive ? does it mean in all cases in all positive numbers I mean some case satisfy this in one positive but the other positive number does not. like question # 3 statement 1 positive base less than 1 satisfied the question but positive base greater than 1 does not satisfy the question answer. I am sorry if I can not express my point. I think I understand what you are asking. When a DS question asks “is a positive?”, it is asking: in all possible cases, in all possible ways of thinking about it, does a absolutely have to be a positive number? Given the constraints, are they so complete that even God Himself could not make a equal a non-positive number according to the constraints given? We could only answer “yes” to the question “is a positive?” if it is 100% certain that a is positive, and absolutely impossible for it to take a non-positive number in any case. If I give the constraint that a > 5, then it is absolutely true that a is positive, because it is absolutely impossible for a number to be greater than 5 but not positive. If I give the constraint, a > -5, then we absolutely cannot give a “yes” answer to the question “is a positive?”, because although a may be positive, it is possible for it to be positive, but it is also possible for a to be zero or any number between zero and -5. We are not interested in “maybes.” We are not interested in “could be’s” We are interested only in iron-clad 100% certain information, and we don’t have that, we dont’ have sufficiency in the DS sense. 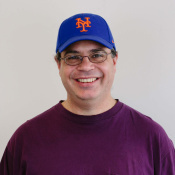 Mike, just wanted to say that this is a pretty useful post for developing a grid by which to test exponents. Dear Avinash: Thank you for your kind words. Best of luck to you, and let us know if you have any further questions.